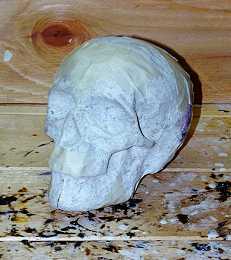 Although the process is a bit time consuming, the end result is worth the effort, especially if you're looking for cheap skulls. 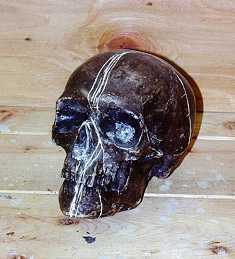 From these basic skulls, you can add whatever final details you wish. For outdoor use, I would recommend a few coats of water resistant polyurethane. 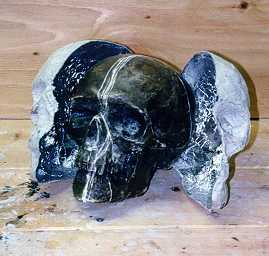 Start with a skull mold. that I got for Halloween one year. 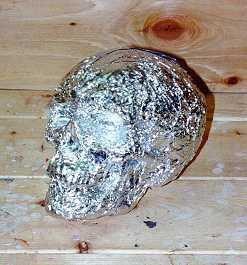 Cover the mold with aluminum foil. from adhering to the mold. 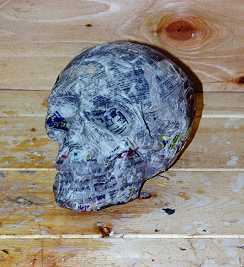 newspaper strips on the mold. to dry enough for removal. all the way around the mold. Tape the 2 halves back together.